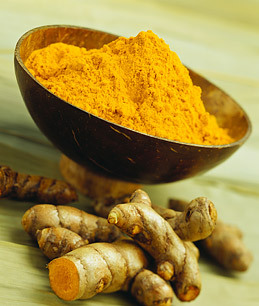 Turmeric is part of the ginger family and is native to tropical South Asia. The plants are gathered annually for their rhizomes, which are boiled for several hours and then dried in hot ovens. After they are dry they are ground into a deep orange-yellow powder which is commonly used as a spice in curries and other South Asian and Middle Eastern dishes. Its active ingredient is curcumin and it has a distinct earthy, slightly bitter, slightly peppery flavour, and smells of mustard. And interesting fact is that curcumin can be used to test the alkalinity or acidity of foods. If the food is acid it turns yellow and if the food is alkaline it turns red. When combined with cauliflower it has been shown to prevent prostate cancer and stop the growth of existing prostate cancer. If curries don't particularly appeal to you, there are turmeric supplements available that will give you the same benefits. Warning : Turmeric should not be used by people with gallstones or bile obstruction, and pregnant women should consult their doctor before using it as it can be a uterine stimulant. 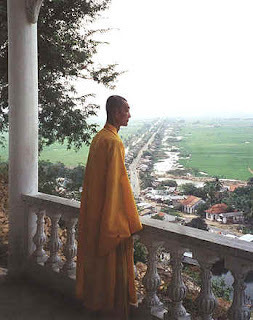 Turmeric is commonly used in Indian and Babgladeshi clothing, such as saris and Buddhist monks' robes. However I would not recommend you try this unless you are prepared to wash the item by hand as this is has a tendency to bleed colour. It can also be used as a mask. Try this traditional recipe from India that has been used to fight acne and promote overall healthy skin. Mix 1/2 teaspoon of turmeric powder into 3 tablespoons of organic plain yogurt. Rub this mixture all over your face and neck. Leave it on for a few minutes, then wash it off with warm water. 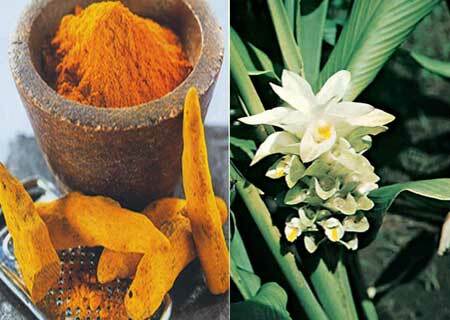 There are also various creams that will give you the benefits of turmeric as well. Using turmeric in cooking is the most common way to use this spice. Here is a great warming recipe for a cool fall day. This is a soup recipe that will make a very filling meal for 4 people. Chop half of one onion, then place in a blender with the ginger, garlic and 1/4 cup of water and puree until smooth. Season the chicken thigh meat with salt and pepper, then brown in a bit of coconut oil. Remove and place into your slow cooker. Add the ginger puree and stir. Slice the remaining 1 1/2 onions into thin slices. Add these to your skillet and cook until softened. Stir in the turmeric, paprika and cayenne pepper. Add to the slow cooker. Add the chicken broth, cover, and cook on low for 4 hours. Add the coconut milk and cook for another 30 minutes. Wash the miracle noodles or make the egg noodles, and divide into 4 bowls. Ladle the soup over the noodles. Garnish each serving with chopped cilantro, chopped green onions, half a hard boiled egg, sliced, and serve lemon wedges on the side. 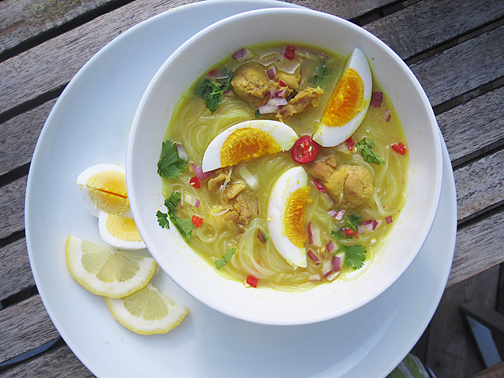 This soup is traditionally made with noodles but it is also delicious with cauliflower rice.